Why do I need to be a customer to chat with the support at Expekt.com? Using live chat support is a great way to give players a fast response/answer to their questions. But should you need to be a customer to be able to talk to the live chat support? At Expekt.com you need to supply your “Customer ID” or “Username”. I think that is really bad solution! I understand that it is easier for the support to answer specific questions if they know who they are “talking” to, but it should still be possible to talk to the support even before you are a customer. Image 1. 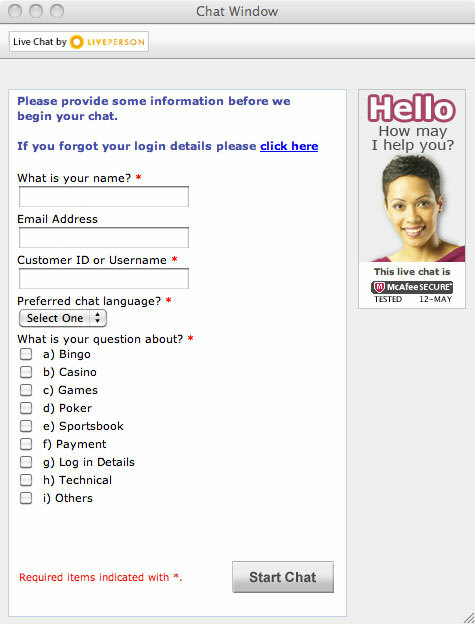 Expekt.com’s live chat window.